Summer signing Andy Fleming had a dream debut as Morecambe dumped Championship side Coventry out of the Carling Cup. The League Two Shrimps led in first-half injury time when Fleming converted Adam Rundle's accurate cross. Fleming added a second just after the hour with a similar clinical finish as Rundle again provided the assist with another centre from the left wing. Coventry missed various chances, Chris Hussey and Craig Stanley both hitting the post and Carl Baker heading over. The visitors' two best chances fell to Roy O'Donovan, who could have given his side the lead when taking advantage of an error from Darren Moss, but hit a weak shot wide. O'Donovan also missed an excellent chance early in the second half. "I picked a team that I thought was capable of going to win a game but in the end we didn't get anything we didn't deserve. "We didn't take our early chances and because of that they came into it. "In the second half they were by far the better team and we were very, very poor." 90:00+3:48 Attacking throw-in by Cyrus Christie (Coventry). 90:00+3:32 Cross by Carl Baker (Coventry), resulting in open play. 90:00+2:40 Corner from left by-line taken short right-footed by Craig Stanley (Morecambe). 90:00+1:58 Goal kick taken long by Barry Roche (Morecambe). 90:00+1:41 Shot by Clive Platt (Coventry) right-footed from right channel (18 yards), missed left. 90:00+1:20 Defending throw-in by Cyrus Christie (Coventry). 90:00+0:49 Goal kick taken long by Barry Roche (Morecambe). 90:00+0:30 Shot by Clive Platt (Coventry) volleyed right-footed from centre of penalty area (18 yards), over the bar. 89:39 Foul by Paul Mullin (Morecambe) on Richard Wood (Coventry). Direct free kick taken left-footed by Jordan Clarke (Coventry) from left wing, passed. 89:07 Attacking throw-in by Jordan Clarke (Coventry). 88:29 Attacking throw-in by Laurence Wilson (Morecambe). 88:09 Goal kick taken long by Colin Doyle (Coventry). 87:40 Defending throw-in by Cyrus Christie (Coventry). 87:10 Defending throw-in by Jordan Clarke (Coventry). 86:28 Attacking throw-in by Jordan Clarke (Coventry). 85:56 Substitution Morecambe substitution: Adam Rundle replaced by Mark Duffy (tactical). 84:22 Cross by Jordan Clarke (Coventry), save (caught) by Barry Roche (Morecambe). 83:24 Attacking throw-in by Carl Baker (Coventry). 82:45 Defending throw-in by Jordan Clarke (Coventry). 82:08 Defending throw-in by Jordan Clarke (Coventry). 81:39 Attacking throw-in by Darren Moss (Morecambe). 81:34 Attacking throw-in by Chris Shuker (Morecambe). 81:19 Cross by Garry Hunter (Morecambe), save (caught) by Colin Doyle (Coventry). 81:04 Attacking throw-in by Darren Moss (Morecambe). 80:04 Shot by Chris Shuker (Morecambe) right-footed from centre of penalty area (6 yards), save (caught) by Colin Doyle (Coventry). 79:47 Attacking throw-in by Darren Moss (Morecambe). 77:27 The ball is crossed by Craig Stanley, Header from deep inside the penalty area by Paul Mullin goes harmlessly over the crossbar. 77:27 Substitution Garry Hunter comes on in place of Andrew Fleming. 77:27 Substitution Paul Mullin is brought on as a substitute for Phil Jevons. 77:21 Booking Richard Wood (Coventry) booked for unsporting behaviour. 77:21 Foul by Richard Wood (Coventry) on Paul Scott (Morecambe). Correction - 77:21 Cross by Craig Stanley (Morecambe), header by Paul Mullin (Morecambe) from centre of penalty area (12 yards), over the bar. Correction - 77:21 Substitution Morecambe substitution: Andrew Fleming replaced by Garry Hunter (tactical). Correction - 77:21 Substitution Morecambe substitution: Phil Jevons replaced by Paul Mullin (tactical). Correction - 77:21 Booking Richard Wood (Coventry) booked for unsporting behaviour. 77:02 Defending throw-in by Darren Moss (Morecambe). 76:50 Goal kick taken long by Barry Roche (Morecambe). 76:22 Shot by Jermaine Grandison (Coventry) right-footed from right channel (20 yards), missed left. 76:05 Cross by Carl Baker (Coventry), save (punched) by Barry Roche (Morecambe). 75:28 Phil Jevons (Morecambe) caught offside. Direct free kick taken right-footed by Richard Wood (Coventry) from own half, passed. 74:56 Defending throw-in by Laurence Wilson (Morecambe). 74:28 Attacking throw-in by Adam Rundle (Morecambe). 74:05 Foul by Clive Platt (Coventry) on Paul Scott (Morecambe). Direct free kick taken right-footed by Andy Parrish (Morecambe) from own half, resulting in open play. 73:49 Attacking throw-in by Laurence Wilson (Morecambe). 73:23 Laurence Wilson restarts play with the free kick. 72:55 Booking Jermaine Grandison (Coventry) booked for unsporting behaviour. 72:55 Foul by Jermaine Grandison (Coventry) on Laurence Wilson (Morecambe). Correction - 72:55 Direct free kick taken left-footed by Laurence Wilson (Morecambe) from own half, resulting in open play. Correction - 72:55 Booking Jermaine Grandison (Coventry) booked for unsporting behaviour. 72:21 Goal kick taken long by Colin Doyle (Coventry). 71:57 Inswinging corner from right by-line taken left-footed by Adam Rundle (Morecambe) to centre, resulting in ball out of play. 71:41 Attacking throw-in by Darren Moss (Morecambe). 71:36 Defending throw-in by Jordan Clarke (Coventry). 71:11 Defending throw-in by Laurence Wilson (Morecambe). 70:47 Defending throw-in by Jordan Clarke (Coventry). 69:26 Foul by Jordan Clarke (Coventry) on Craig Stanley (Morecambe). Direct free kick taken right-footed by Chris Shuker (Morecambe) from right wing, header by Chris McCready (Morecambe) from centre of penalty area (12 yards), missed left. 69:02 Attacking throw-in by Darren Moss (Morecambe). 68:39 Attacking throw-in by Darren Moss (Morecambe). 68:13 Defending throw-in by Darren Moss (Morecambe). 68:04 Defending throw-in by Jordan Clarke (Coventry). 66:23 Substitution Coventry substitution: David Bell replaced by Jonson Clarke-Harris (tactical). 66:23 Foul by Richard Wood (Coventry) on Phil Jevons (Morecambe). Direct free kick taken right-footed by Craig Stanley (Morecambe) from right wing, resulting in open play. 65:52 Attacking throw-in by Jordan Clarke (Coventry). 65:41 Cross by Carl Baker (Coventry), resulting in open play. 65:22 Attacking throw-in by David Bell (Coventry). 64:51 Goal kick taken long by Barry Roche (Morecambe). 64:26 Goal kick taken long by Barry Roche (Morecambe). 62:25 Goal kick taken long by Colin Doyle (Coventry). 62:05 Shot by Craig Stanley (Morecambe) right-footed from left channel (30 yards), hit bar. 61:53 Cross by Michael McIndoe (Coventry), save (caught) by Barry Roche (Morecambe). 60:37 Assist (pass) by Adam Rundle (Morecambe) from left by-line. 60:37 GOAL - Andrew Fleming:Morecambe 2 - 0 Coventry Goal by Andrew Fleming (Morecambe) left-footed (bottom-right of goal) from centre of penalty area (6 yards).Morecambe 2-0 Coventry. Correction - 60:37 Assist (pass) by Phil Jevons (Morecambe) from left by-line. Correction - 60:37 GOAL - Andrew Fleming:Morecambe 2 - 0 Coventry Goal by Andrew Fleming (Morecambe) left-footed (bottom-right of goal) from centre of penalty area (6 yards).Morecambe 2-0 Coventry. 59:41 Foul by James McPake (Coventry) on Phil Jevons (Morecambe). Free kick crossed right-footed by Phil Jevons (Morecambe) from left channel, resulting in open play. 59:36 Defending throw-in by Cyrus Christie (Coventry). 59:15 Shot by Craig Stanley (Morecambe) left-footed from centre of penalty area (6 yards), hit post. 59:04 Attacking throw-in by Darren Moss (Morecambe). 58:42 Attacking throw-in by Clive Platt (Coventry). 58:07 Defending throw-in by Darren Moss (Morecambe). 57:45 Foul by Paul Scott (Morecambe) on Carl Baker (Coventry). Direct free kick taken right-footed by Colin Doyle (Coventry) from own half, resulting in open play. 57:17 Cross by Adam Rundle (Morecambe), resulting in open play. 56:55 Goal kick taken long by Barry Roche (Morecambe). 56:21 Attacking throw-in by Cyrus Christie (Coventry). 56:04 Goal kick taken long by Colin Doyle (Coventry). 55:48 Shot by Phil Jevons (Morecambe) volleyed left-footed from left channel (20 yards), missed right. 55:37 Goal kick taken long by Barry Roche (Morecambe). 55:16 Goal kick taken long by Barry Roche (Morecambe). 54:40 Handball by Andrew Fleming (Morecambe). Free kick crossed left-footed by Michael McIndoe (Coventry) from left channel, resulting in ball out of play. 54:28 Cross by David Bell (Coventry), resulting in open play. 53:26 Attacking throw-in by Laurence Wilson (Morecambe). 52:36 Defending throw-in by Laurence Wilson (Morecambe). 52:30 Attacking throw-in by David Bell (Coventry). 52:01 Cross by Phil Jevons (Morecambe), clearance by Richard Wood (Coventry). 51:28 Foul by James McPake (Coventry) on Phil Jevons (Morecambe). Direct free kick taken right-footed by Craig Stanley (Morecambe) from right channel, passed. 51:18 Goal kick taken long by Barry Roche (Morecambe). 51:02 Shot by Roy O'Donovan (Coventry) volleyed right-footed from centre of penalty area (12 yards), missed right. 50:49 Defending throw-in by Laurence Wilson (Morecambe). 50:43 Goal kick taken by Barry Roche (Morecambe). Correction - 50:43 Goal kick taken long by Barry Roche (Morecambe). 50:03 Shot by David Bell (Coventry) volleyed right-footed from right wing (20 yards), missed right. 49:22 Defending throw-in by Jordan Clarke (Coventry). 49:06 Goal kick taken long by Colin Doyle (Coventry). 48:45 Shot by Laurence Wilson (Morecambe) left-footed from left wing (20 yards), missed right. 48:24 Defending throw-in by Jordan Clarke (Coventry). 48:07 Cross by Michael McIndoe (Coventry), resulting in open play. 47:42 Attacking throw-in by Chris Shuker (Morecambe). 46:38 Defending throw-in by Jordan Clarke (Coventry). 46:19 Attacking throw-in by Darren Moss (Morecambe). 45:42 Foul by Jordan Clarke (Coventry) on Andy Parrish (Morecambe). Direct free kick taken right-footed by Barry Roche (Morecambe) from own half, resulting in open play. 45:28 Foul by Darren Moss (Morecambe) on Michael McIndoe (Coventry). Direct free kick taken left-footed by Richard Wood (Coventry) from own half, resulting in open play. 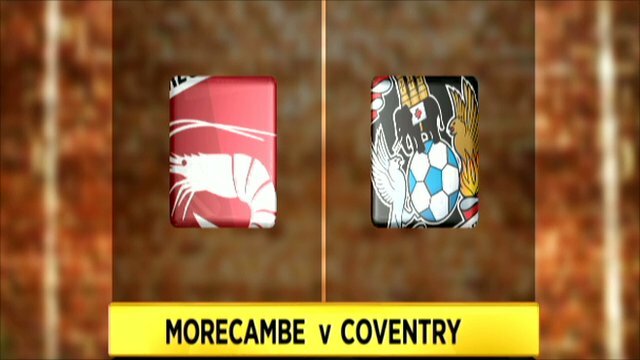 Correction - 45:00+1:25 GOAL - Andrew Fleming:Morecambe 1 - 0 Coventry Goal by Andrew Fleming (Morecambe) right-footed (high centre of goal) from centre of penalty area (6 yards).Morecambe 1-0 Coventry. 45:00+1:25 Assist (cross) by Adam Rundle (Morecambe) from left by-line. 45:00+1:25 GOAL - Andrew Fleming:Morecambe 1 - 0 Coventry Headed goal by Andrew Fleming (Morecambe) (high centre of goal) from centre of penalty area (6 yards).Morecambe 1-0 Coventry. 45:00+1:04 Cross by Chris Shuker (Morecambe), resulting in open play. 45:00+0:32 Goal kick taken long by Barry Roche (Morecambe). 45:00+0:05 Phil Jevons (Morecambe) caught offside. Direct free kick taken right-footed by Colin Doyle (Coventry) from own half, resulting in open play. 44:12 Roy O'Donovan (Coventry) caught offside. Direct free kick taken right-footed by Barry Roche (Morecambe) from own half, resulting in open play. 43:17 Attacking throw-in by Darren Moss (Morecambe). 42:51 Attacking throw-in by Paul Scott (Morecambe). 42:19 Goal kick taken long by Barry Roche (Morecambe). 42:10 Cross by Carl Baker (Coventry), resulting in ball out of play. 41:53 Defending throw-in by David Bell (Coventry). 41:38 Cross by Chris Shuker (Morecambe), clearance by James McPake (Coventry). 41:09 Attacking throw-in by Darren Moss (Morecambe). 40:36 Defending throw-in by Darren Moss (Morecambe). 40:01 Goal kick taken long by Barry Roche (Morecambe). 38:12 Outswinging corner from right by-line taken right-footed by David Bell (Coventry) to far post, resulting in open play. 37:57 Shot by David Bell (Coventry) right-footed from right side of penalty area (18 yards), blocked by Andy Parrish (Morecambe). 36:33 Foul by Clive Platt (Coventry) on Barry Roche (Morecambe). Direct free kick taken right-footed by Barry Roche (Morecambe) from own half, resulting in open play. 36:04 Goal kick taken long by Colin Doyle (Coventry). 34:40 Foul by Jermaine Grandison (Coventry) on Paul Scott (Morecambe). Free kick curled left-footed by Laurence Wilson (Morecambe) from right channel (25 yards), missed right. 34:09 Goal kick taken long by Barry Roche (Morecambe). 34:00 Cross by David Bell (Coventry), resulting in ball out of play. 33:43 Corner from left by-line taken short right-footed by David Bell (Coventry). 33:23 Shot by Carl Baker (Coventry) right-footed from left channel (18 yards), blocked by Andy Parrish (Morecambe). 33:07 Goal kick taken long by Colin Doyle (Coventry). 32:44 Cross by Craig Stanley (Morecambe), resulting in ball out of play. 31:30 Handball by Clive Platt (Coventry). Direct free kick taken right-footed by Barry Roche (Morecambe) from own half, resulting in open play. 31:21 Attacking throw-in by Jordan Clarke (Coventry). 31:08 Goal kick taken long by Barry Roche (Morecambe). 30:12 Substitution Coventry substitution: Chris Hussey replaced by Cyrus Christie (injury). 28:11 Shot by Chris Hussey (Coventry) left-footed from right channel (20 yards), missed right. 27:34 Inswinging corner from right by-line taken left-footed by Chris Hussey (Coventry) to short, resulting in open play. 26:58 David Bell (Coventry) caught offside. Indirect free kick taken left-footed by Laurence Wilson (Morecambe) from own half, passed. 25:39 Goal kick taken long by Colin Doyle (Coventry). 25:32 Cross by Chris Shuker (Morecambe), resulting in open play. 24:51 Defending throw-in by Darren Moss (Morecambe). 23:38 Goal kick taken long by Barry Roche (Morecambe). 23:18 Shot by Roy O'Donovan (Coventry) left-footed from centre of penalty area (12 yards), missed right. 22:10 Goal kick taken long by Barry Roche (Morecambe). 21:51 Foul by Phil Jevons (Morecambe) on James McPake (Coventry). Direct free kick taken left-footed by Richard Wood (Coventry) from own half, resulting in open play. 21:30 Defending throw-in by Darren Moss (Morecambe). 20:40 Foul by Adam Rundle (Morecambe) on James McPake (Coventry). Direct free kick taken right-footed by Colin Doyle (Coventry) from own half, resulting in open play. 19:54 Foul by Jermaine Grandison (Coventry) on Craig Stanley (Morecambe). Direct free kick taken right-footed by Barry Roche (Morecambe) from own half, resulting in open play. 19:40 Goal kick taken short by Colin Doyle (Coventry). 19:15 Inswinging corner from left by-line taken right-footed by Craig Stanley (Morecambe) to far post, resulting in ball out of play. 19:04 Cross by Craig Stanley (Morecambe), blocked by Jordan Clarke (Coventry). 18:48 Attacking throw-in by Laurence Wilson (Morecambe). 18:30 Defending throw-in by Jordan Clarke (Coventry). 17:53 Defending throw-in by Chris Hussey (Coventry). 17:34 Defending throw-in by Darren Moss (Morecambe). 17:03 Foul by Roy O'Donovan (Coventry) on Andy Parrish (Morecambe). Direct free kick taken right-footed by Barry Roche (Morecambe) from own half, resulting in open play. 16:38 Inswinging corner from left by-line taken left-footed by Chris Hussey (Coventry) to near post, clearance by Andy Parrish (Morecambe). 16:14 Cross by Michael McIndoe (Coventry), clearance by Laurence Wilson (Morecambe). 16:05 Goal kick taken long by Barry Roche (Morecambe). 15:41 Shot by Clive Platt (Coventry) right-footed from right channel (18 yards), over the bar. 15:24 Shot by Chris Hussey (Coventry) left-footed from left side of penalty area (12 yards), hit post. 14:59 Cross by Adam Rundle (Morecambe), clearance by James McPake (Coventry). 14:36 Inswinging corner from right by-line taken left-footed by Adam Rundle (Morecambe) to centre, clearance by Clive Platt (Coventry). 14:27 Cross by Darren Moss (Morecambe), clearance by Richard Wood (Coventry). 14:11 Attacking throw-in by Darren Moss (Morecambe). 12:57 Inswinging corner from right by-line taken left-footed by Chris Hussey (Coventry) to near post, clearance by Laurence Wilson (Morecambe). 12:49 Cross by David Bell (Coventry), blocked by Andy Parrish (Morecambe). 12:33 Attacking throw-in by David Bell (Coventry). 11:14 Defending throw-in by Laurence Wilson (Morecambe). 10:43 Attacking throw-in by David Bell (Coventry). 10:16 Foul by Phil Jevons (Morecambe) on Richard Wood (Coventry). Direct free kick taken left-footed by Richard Wood (Coventry) from own half, resulting in open play. 9:51 Shot by Michael McIndoe (Coventry) right-footed from right wing (20 yards), missed right. 9:23 Outswinging corner from right by-line taken right-footed by David Bell (Coventry) to near post, clearance by Craig Stanley (Morecambe). 9:12 Cross by David Bell (Coventry), blocked by Phil Jevons (Morecambe). 8:53 Attacking throw-in by Darren Moss (Morecambe). 8:33 Foul by Clive Platt (Coventry) on Andrew Fleming (Morecambe). Direct free kick taken right-footed by Barry Roche (Morecambe) from own half, resulting in open play. 8:01 Paul Scott (Morecambe) caught offside. Direct free kick taken right-footed by Colin Doyle (Coventry) from own half, resulting in open play. 6:49 Goal kick taken long by Barry Roche (Morecambe). 6:20 Defending throw-in by Laurence Wilson (Morecambe). 5:42 Defending throw-in by Darren Moss (Morecambe). 5:23 Goal kick taken long by Barry Roche (Morecambe). 5:07 Cross by David Bell (Coventry), resulting in ball out of play. 5:02 Attacking throw-in by Chris Hussey (Coventry). 4:34 Shot by Clive Platt (Coventry) right-footed from right channel (20 yards), blocked by Andy Parrish (Morecambe). 3:53 Goal kick taken long by Barry Roche (Morecambe). 3:42 Attacking throw-in by Jordan Clarke (Coventry). 3:25 Attacking throw-in by Laurence Wilson (Morecambe). 3:07 Goal kick taken long by Barry Roche (Morecambe). 2:14 Phil Jevons (Morecambe) caught offside. Direct free kick taken right-footed by James McPake (Coventry) from own half, passed. 1:28 Foul by Andy Parrish (Morecambe) on Clive Platt (Coventry). Direct free kick taken right-footed by Clive Platt (Coventry) from left wing, resulting in open play. 0:59 Attacking throw-in by Jordan Clarke (Coventry). 0:41 Cross by Chris Shuker (Morecambe), resulting in open play.